SUMMARY: A few days after burying her brother Finn, who was killed in action in Afghanistan, 17-year old Honor receives a letter from Finn that was posted before his death. Honor views the letter and enclosed concert tickets as Finn's last wish for her, and she is determined to carry out his plans. 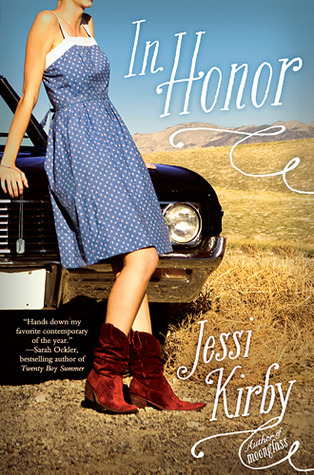 Honor piles into the car with Finn's former best friend Rusty to travel from Texas to California to attend a popular musician's farewell performance. REVIEW: I have seen some high praise for In Honor, but for me, it was just okay. I think the main problem is that I expected a romance along the lines of Morgan Matson's Amy & Roger's Epic Detour; however, the romance really takes a back seat to Rusty and Honor's grief over Finn's sudden death. While the grief is very realistic and well-written, I had hoped for more romance. I did not care for Honor or Rusty. I get that Honor is grieving and people have every right to grieve in their own ways, but she whines incessantly and makes some incredibly dumb choices. Honor's behavior with the police officer near the end was just silly, and I got annoyed at the stereotype of the power-hungry police officer. Rusty, who eases his pain with a little brown bottle, does not seem like a healthy choice for Honor at all. Rusty is only 19 years old; far too young to drink constantly, and I felt like his alcoholism was supposed to be justified because he is grieving. I just couldn't root for either of them. Despite all my complaints and minor annoyances, I do see why people love this book. Author Jessi Kirby does a beautiful job making the reader really feel Honor's grief, and I think In Honor would be a wonderful choice for students experiencing the recent death of a close relative. I especially love the way Honor and Rusty find their own way to honor Finn's memory that is both simple and peaceful and absolutely perfect. In Honor will help grieving students understand their grief and see how others in a similar situation cope with loss. The little twist on the last two pages was really cute and made me smile. Endings are tough to write, and that one fit the story so PERFECTLY. THE BOTTOM LINE: While I wasn't a fan, I have seen lots of great reviews for this book. A great selection for teens dealing with loss. STATUS IN MY LIBRARY: We don't have it. I am undecided on whether to get it because I felt like Rusty's constant drinking was excused away as a coping mechanism. CONTENT: *It's been a week or so since I finished this book, so all my content notes here are from memory.